We offer a full line of 3M™ Masking Tapes that encompass every application imaginable and we will continue to offer all available 3M Tape. 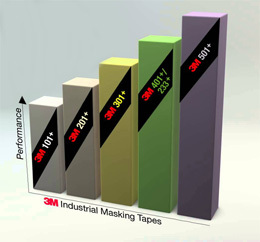 3M has made it simple by introducing a 5 tape system for masking tape. These five pressure sensitive masking tapes are built on increasing levels of performance. For masking, sealing, or bundling. 3M 501+ Specialty High Temperature Purple Masking Tape 6.0 mil Purple High temp. tape, 300°F for up to 30 minutes.